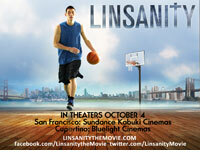 "Linsanity" the movie tells the story of a local Palo Alto star, who is really just your everyday Bay Area kid. He wants to please his parents, get an education, continue his passion for basketball and hang out with friends -- but God sent him on a journey he always dreamed about, but never thought would happen. Linsanity traces Jeremy's life from Palo Alto to his rise with the New York Knicks. Director Leong includes Jeremy's story of faith and perseverance, despite the media frenzy. Linsanity is opening in theatres nationwide, starting October 4th. Click here to check out the trailer to the movie. For more information please visit linsanitythemovie.com.